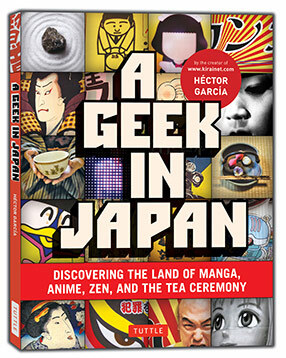 I was dumbstruck when I found out A Geek in Japan by Hector Garcia is an encyclopedia. In this day and age the shear idea of releasing an encyclopedia in paper form makes me cringe, especially when the book at hand is based on an internet blog. However, A Geek in Japan does have a few things to offer once you go beyond this initial reaction. To start off, Garcia’s definition of geek might be different from what you think. He defines a geek as an aficionado, and a Geek in Japan is essentially an all-encompassing book about Japan. Across its 160 pages it covers all manners of Japan-related subjects: history, mannerism, work ethics, traditional culture, popular culture and more.. The book is broadly divided into several chapters but the actual subjects covered in each chapter may or may not be related to that chapter’s title. Seemingly unrelated subject are presented next to each other in rapid secession. For example, the history Buddha Siddhartha, a short introduction to the seven gods of fortune and the peculiar subject “why do Japanese women cover their mouths when they laugh?” can be found next to each other. Naruto appears alongside an explanation on blood groups in Japan, and so on. When I started reading this book I found this to be rather annoying, but as it turns out it’s one of a Geek in Japan’s strongest point. You can go on the net and easily find a much more detailed account on all the subjects presented here, but the sheer randomness of their order is what makes the book work. I would never have thought to check why the importance of blood types is so ingrained in Japan’s modern culture or why hay fever is such a common thing over there. But since these subjects were alongside other subjects I was reading I just kept on reading and absorbed them. As a result I learned some fascinating pieces of trivia. Hector Garcia’s love for Japan is apparent in each page. In his remarks on daily life in Japan I found many resemblances to my own experiences in the land of the shining sun. In later chapters Garcia gives a detailed overview on daily life practices in Japan, from many different perspectives. You can read why school kids there have such a hard time, how a salary man handles himself, what is expected from house wives and how the elderly pass their time. At no point does Garcia clarify how he procured this information though. Did he really interview a retired old man to learn how Japanese spend their retirement years? Speaking of information, the latest reference to date I could find in this book was a record of an event from 2006. And sure enough there are a couple of outdated concepts in the book that also show it might not be as up to date as it should have be. A Geek in Japan does feature the words manga and anime prominently on the cover, so you can probably be sure it has things to say on these subjects. And sure enough you can find a myriad of small subject regarding manga and anime. But much like the rest of the book this is done in a somewhat eclectic fashion. Chapter 8, which is entitled “The world of manga & anime” only contains one page on anime. But by the time you reached this chapter you probably ran into anime subjects in other chapters, and a handful of anime subject awaits in chapter 10, that deals with television. Such is the general flow of this book, for better or worse. The book ends with two chapters about tourism in Japan. These chapters I liked the most. As expected from a book by and for Geeks Garcia gives tourism advice based on geeky themes: where to go on a gadget tour, an otaku tour, a culture tour, and so on. Again, it’s not as varied and in-depth as what you may find in a travel book, but if you are interested in a trip to Japan and want to soak up cultural information as well as travel tips a Geek in Japan might prove surprisingly effective. So is this book a valuable in-depth knowledge bank on Japan? Probably not. Is it a hip up-to-date representation of Japan’s popular culture? Hardly. What a Geek in Japan does offer is variety – juicy pieces of Japanese trivia randomly spread across the board. It’s a coffee table book that fans of Japanese culture can casually pick up and enjoy. It might also be a good gift to buy for a friend who’s planning a trip to Japan in the near future. You can grab your copy of a Geek in Japan on Amazon or directly from the publisher at Tuttle Publishing’s website.